This is the fifteenth post in my North Star November series….a soul centered discussion about depression. Each day this month, I’ll be sharing a piece of my soul’s journey, along with a free pattern to thank you for taking part in such an important conversation! Catch up by reading Day 14. Jump forward to Day 16. Parents are always SO busy. Whether it’s putting the next meal on the table, cleaning up the latest destruction zone, or shuttling someone to the next school event….parents never stop! Sometimes the sheer volume of tasks to do makes self care seem insurmountable. If you’re anything like me, you also have a cacophony of negative voices in your head telling you all the reasons these things you need to do are so important. THE MOST IMPORTANT thing you can do for the people around you is to take care of yourself. If you’re constantly feeling run down, negative, and sad, how are you supposed to show up for the people in your life as your best self? In the midst of learning this lesson myself, a prior co-worker made an eye-opening statement to me. Have you filled your watering can lately? Wow. What a simple metaphor for the lack of love I’d given myself over the years. Have you been filling your own watering can? 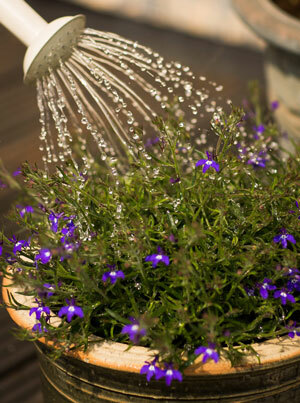 Or have you been totally focused on the flower garden you’re watering? Many of you, like me, love to “fill your watering can” through knit or crochet. So sharing these free patterns throughout the month has been a really fun way for me to feel like I could be helping you do that. 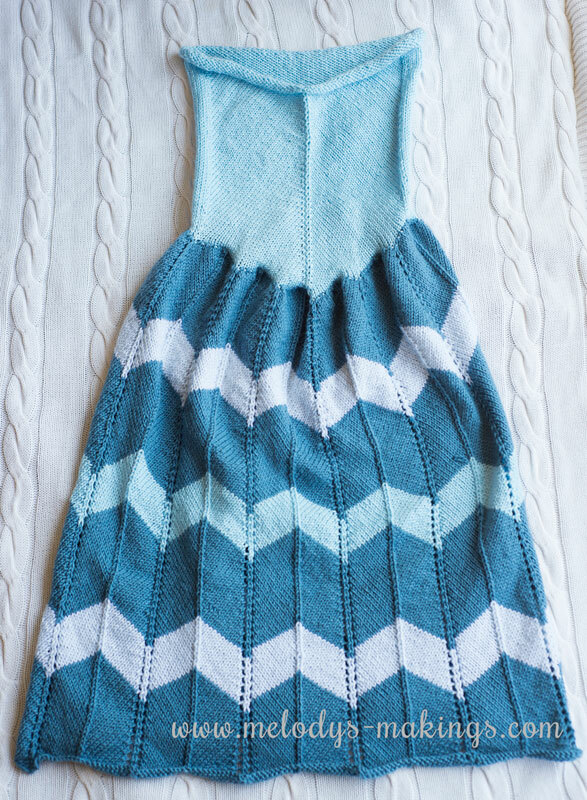 Today I’m sharing my knit Ice Queen Dress Blanket Pattern. KFB2: Knit each of the next two sts through both the front and back loops. Cast on 118 sts on Circular Needles using Color 2 yarn. Repeat Rounds 1&2 until your project measures approx. 12 inches (30.5cm) in length from the cast on edge. Continue to Repeat this alternating color sequence until your project measures approx. 34” (86cm) from the cast on edge (measure along side of bodice). End after a repeat of a Color 1 Round 6 (the full 12 rounds). Bind off in Round 5 pattern. Secure and weave in all ends. Repeat Rounds 1&2 until your project measures approx. 14 inches (35.5cm) in length from the cast on edge. Continue to Repeat this alternating color sequence until your project measures approx. 42 inches (106.5cm) from the cast on edge. End after a repeat of a Color 1 Round 6 (the full 12 rounds). Repeat Rounds 1&2 until your project measures approx. 15 inches (38cm) in length from the cast on edge. Continue to Repeat this alternating color sequence until your project measures approx. 46 inches (117cm) from the cast on edge (measure along side of bodice). End after a repeat of a Color 1 Round 6 (the full 12 rounds). Bind off in Round 4 pattern. Secure and weave in all ends. At times I’m focused on watering the flower garden which become unappreciated and some of these nasty flowers are unappreciative and only think of their selves of being all good, but now I always keep my own water can filled and my flower garden is much more blessed! Awesome 🙂 I bet suddenly the garden is more beautiful too. Thank you for your comments yesterday. Today is a bit better. Some who thought they were helping were stressing me more. Literally had to say NO to several people yesterday and that word is hard for me. But it was worth it. Still no heat but we have a plan today. Hope you and all your are touching through these posts have a good day today. And thank you again for everything! SO glad to get an update and to hear that things are improving a bit! Why is it so difficult to say no?? I don’t know, but I’m happy to hear you’re doing what’s best for you. Way to go! I’m just coming to terms with this. Until I can look after me I can’t give the best me to those who deserve it. Try g to start my journey out of this slump instead of just digging deeper. My mother, God love her, was a bit of a martyr, which was the part of her I should have ignored but I took her model to heart. It wasn’t until my kids were grown that I learned two incredible lessons: kids are responsible for their own happiness and boredom, and no one likes the martyr. It’s freeing, actually. My kids turned out to be good people, even if they weren’t in every sport, activity or private lesson, and management has learned to listen when I tell them there’s a problem. Working extra to hide or compensate says you aren’t doing the job in the time allotted. That’s a management problem. My monkeys and circus look different, and I get to be with them. I know this isn’t the place to ask for help on a another project but idk where else to go?? Do you ever make videos to help with the patterns? Lol. I bought the truck slipper pattern but this is my first time following pattern only and I’m not doing it perfectly. Lol. That is so the truth. I know it but when there is no there to help you, you basically keep going until you can’t any more. This just happened to me just yesterday. I take care of my father. He will be 80 on Friday. He has had doc appt everyday for the past week and a half. I’ve had to take him. He doesn’t drive. We are gone up to 4 hours a day. He also wants to go shopping, etc. I clean, cook, laundry, among other things. Oh yeah I’m also married. No help on that end. Well I laid down about 4 yesterday after we got home from an appt and I woke up this morning at 11. WOW. I guess I was exhausted. I told my husband I need your help. He just looked at me and walked away. I didn’t know what else to say. I just want to thank you for sharing this journey with all of us. As a mom of 4 and a grandmom of 1, I have days where I question if I failed my family in any way, but I never wonder if I have failed myself. Like my own mother, I never stop to think about myself, but always my children. I have let my own physical and mental health fail and realize that I need to take care of me so that I can continue to take care of them. 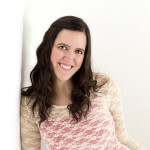 By sharing your journey, you have opened the eyes of so many people, including me. Thank you so very much for doing this. I’m doing pretty well keeping the balance between giving to other lately and taking care of myself but there is ONE area that I struggle in. I need to get more sleep at night. I am an early riser so I can exercise but need to set myself a better bedtime. Thank you for the reminder. This is an area I’ve really been working hard on lately too. Getting enough sleep is so important…yet it feels hard to “give up” those evening hours. Lately I’ve started to embrace my 8pm-ish bed time though, and things go much smoother in the day.